Last weekend I was in charge of my six year old sister as my parents were away. This always means a weekend full of fun and games. I always ask her what she would like to do - in the past we have done little trips to Aldeburgh, Thorpeness, Jimmy's Farm... we call these trips "bear hunts" as I like to make her feel as though we are heading on an adventure. Last weekend she announced that our "bear hunt" would literally be a Bear Hunt. 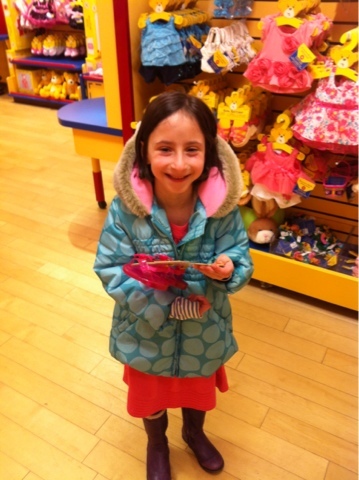 She said "Randa, I want to Build a Bear". Pause. "Sorry?" I said. What on earth does she mean? I began to panic that her expectations wouldn't be met and she would head back to school on Monday morning with her "tail between her legs" because I hadn't managed to pull together a fun filled couple of days with her. I asked her to explain how we were meant to go about building a bear. 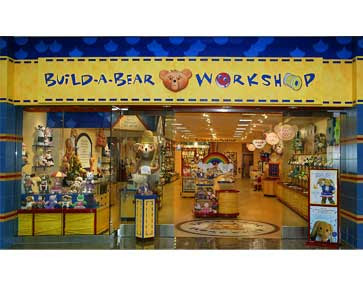 She said "You know what I mean, I want to go to the Build a Bear Workshop." Aaahh. Right. Now I know exactly what she is talking about. Help. Her wish was my command. I looked up where this "workshop"/shop was and off we went. I had never been into one of these shops before but I had seen them dotted around London. I felt this was more of an adventure for me than it was her. The shop was in a town which I dont really know, neither did I know where to park or how to get from the car park to the shop. The minute we hit the outskirts of Colchester, I began to think we had made a big mistake. Saturday shoppers were pouring in. A journey that should have taken us 25 minutes at the most turned into an hour very quickly. But eventually we found the car park and then eventually found the shop too and she quickly set to work building a bear. And I have to admit - it was great fun. She already has one of these bears and I hoped that all she wanted was to choose some further outfits for her bear, named Rainbow, because as far as I could work out all Rainbow had to wear was a bikini. But not even I could resist the softest bunny rabbit that she picked out (named Amy). She looked at me and fluttered her eye lashes and before I could say yes, we were having it stuffed, given a heart and sewn up ready to dress. Amy was also given a Birth Certificate! Her other reason for wanting a new bear was that Rainbow needed a friend. Not even I could bare the thought of Rainbow being all alone with only Barbie to talk to..
Just want to say Like on all levels. What a fab big sis you are. A very successful bear hunt. Thank you for your brilliant post!